"To lose one parent may be regarded as misfortune; to lose both looks like carelessness." When Oscar Wilde's comedy of manners was running theatrically in 1895, it was ironically cut short by his trial and conviction for immorality. Even more ironic is that the most notable film to be made of that play was directed by Anthony Asquith, son of the British Home Secretary (later Prime Minister) Herbert Asquith, who ordered Wilde's arrest in the first place. The younger Asquith fully expiates for his father's judgment with this sparklingly realized comedy. Jack Hollings (Michael Redgrave), a monied orphan, has invented a wicked younger brother, Ernest, in order to run off to London to chastise him. While there, he becomes Ernest himself. He loves Gwendolen Fairfax (Joan Greenwood), who is primarily enamored of the name Ernest. When scampish friend Algernon Moncrieff (Michael Denison) learns of Jack's deception, he shows up at Hollings' country estate masquerading as the fictional brother and finds that Jack's ward Cecily (Dorothy Tutin) is equally enamored of the villainous Ernest. Along the way, hundreds of Wilde turns of phrase and bon mots make for a witty experience against a somewhat silly situation of errors. The cast here is letter-perfect. Most notable is Gwendolen's mother, Lady Bracknell (Dame Edith Evans), who provides a textbook definition of the word "imperious," capable of drawing the word "handbag" out into at least four disapproving syllables. Having already played the role on stage for thirty years when the picture was made, she gleefully steals every scene that she's in. Similarly larcenous is the delightful Margaret Rutherford as Cecily's governess Miss Prism. Joan Greenwood delivers her part in a sultry, throaty voice that smacks of sensuousness and makes one believe that Jack could be so wildly in love with her to concoct his daffy scheme. Redgrave is finely stuffy and simultaneously exasperated with Algernon's taking advantage of the situation. 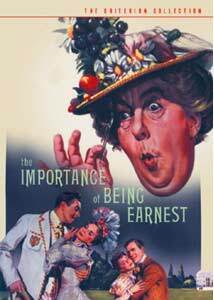 Even moreso than the stage version, this film is a stab at British classism, with Lady Bracknell's insistence on a proper ancestry, which is not present in Jack/Ernest's orphan status. Yet she is more than willing to overlook that on purely mercenary motives. Throughout the piece, even the monied classes acknowledge their own empty-headedness and general uselessness. Obsessions with food run throughout the piece as well, from Lady Bracknell's cucumber sandwiches, to sausages, muffins, tea, cakes and bread and butter and the various class assocations that each of them carry. Asquith makes no bones about the stage origins of the piece; he opens and closes with a scene of the interior of a theater, with the red curtain opening and closing. In between, however, the work is thoroughly cinematic, particularly with creative linkings from one scene to another. A striking example is a zoom into one of Redgrave's lapels, which dissolves into his suit lapel bearing a gardenia. Such little flourishes help keep this from feeling stagebound, as is far too often the case in such adaptations. Image Transfer Review: The Technicolor full-frame picture has its good and bad points. Quite detailed and sharp, it is attractive for the most part. However, the color is rather unstable, with skin tones flickering from pale to ruddy. Lady Bracknell's grey dress occasionally develops a pink cast. Furthermore, the first reel or so has a highly distracting hair that sticks down into the frame and draws attention away from the cast. Oddly enough there is a significant jitter to the picture about 2/3 of the way in. The film source is somewhat on the grainy side, but otherwise appears to be in very good condition. Audio Transfer Review: As is the case with most British films of any age, there is a good deal of hiss and noise present on the 1.0 mono track. That seems to be unavoidable, but the dialogue is thankfully quite clear here. The music is tinny and thin as well. Extras Review: In addition to a quite attractive trailer (that seems to have less of a color stability problem than the feature), there is a set of production notes in the pamphlet as well as a set of biographies and filmographies for the director, cast and crew, with over 40 stills and publicity materials interspersed between. Unlike the usual still gallery, this provides a very welcome context for the illustrations and a good deal of information is conveyed. A fine comedy with a perfect cast, with some problematic issues on the audio and video sides. While the extras are slight, they are highly informative.